We love this place. It is a great healthy option. It is always fresh and great food. They are very accommodating for someone with an allergy. First visit to this cool business. Delicious salad prepared by friendly beautiful staff. Relaxed atmosphere. I highly recommend! Great place to eat at and the perfect atmosphere for a first job or so I thought so I decided to apply for my job at Red Leaf...little did I know what I would be getting into I will never eat there again I left in tears more than 4 times and was asked by the owner if I understood “F*cking English” I felt extremely discriminated on more than one occasion and was verbally attacked by the owner. I will never give my service again and was not even given enough respect to be told I was fired I was simply not put back on the schedule. I am truly in awe of how delicious this place is. The items used for the salads are always fresh. I go there at least once a week. So many choices to make a wrap or salad of your choice. The Best part is the chopping of the salad. No more large pieces trying to cram into your mouth. After you have a salad here you won’t go anywhere else. Enjoy!! 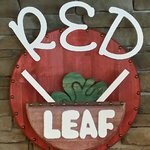 Been to Red Leaf Salad Company? Share your experiences!